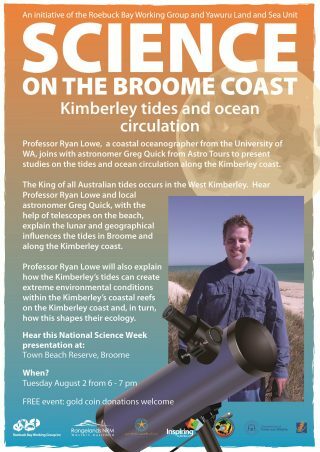 This National Science Week event is about Kimberley tides and astronomy. Hear Professor Ryan Lowe and astronomer Greg Quicke with the help of telescopes, explain lunar and geographical influences of the tides in Broome and Kimberley coast. Kimberley tides and ocean circulation, Town Beach Reserve, Tuesday, August 2 at 6pm. This event is sponsored by National Science Week, Inspiring Australia, Yawuru Land and Sea Unit, WA Marine Science Institution, University of Notre Dame, Department of Parks and Wildlife, Rangelands NRM through the Federal Government Landcare Program. Tropical ecologist Georgia-Ward Fear has been working on the cane toad frontline for eight years with the Balanggarra rangers. Georgia will share her study on the most heavily impacted species, the Yellow-spotted Floodplain Monitor and training she has been doing to discourage them from eating cane toads. 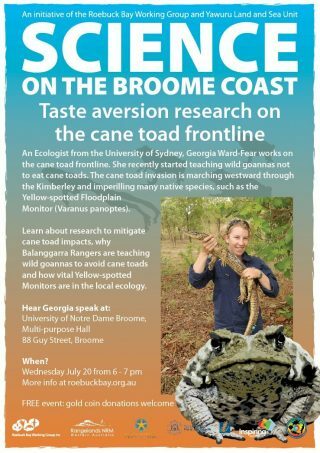 Taste aversion research on the cane toad frontline, University of Notre Dame Multipurpose Hall, Wednesday, July 20 at 6pm.